The idea of wearing a saree in winters never went down well with me! Not because I did not like sarees but how to save myself from the cold weather. A simple shawl would never suffice my need to keep warm. During winter weddings, I always see women wearing sarees with backless blouses, lehenga choli in sheer fabrics and even I have done the same and till date, I do that (LOL). 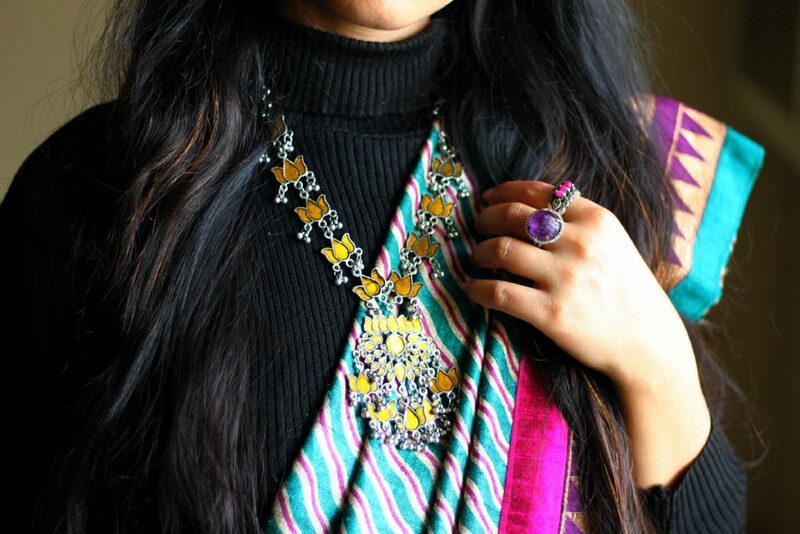 The thought of wearing a saree with a cardigan or sweater always scared me. I just couldn’t do that. But lately, I have realized why to kill oneself for fashion! Fashion must be weather and comfort appropriate. What is the point of shivering in the weather just to look fashionable and then falling sick! This has happened to me after many weddings and parties. Hence, it is better to be wise and make correct choices. 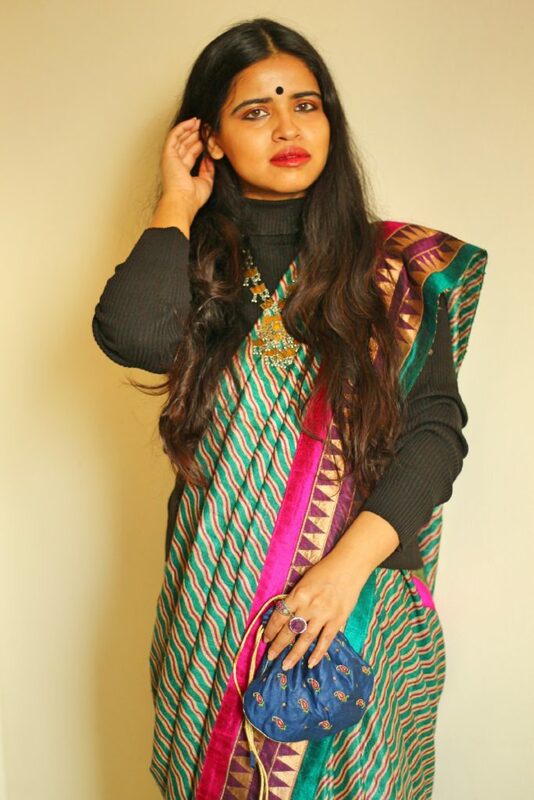 Choosing the right kind of saree for the weather is absolutely essential and the first step to nail a winter saree look. If you choose right kind of fabric with perfect finishing touches, you can rock a saree even with a sweater or coat or cardigan. Silk sarees are the most graceful and appropriate pick for the winter weather. The variety is enormous from light to heavy designs depending on the occasion you are planning to attend. 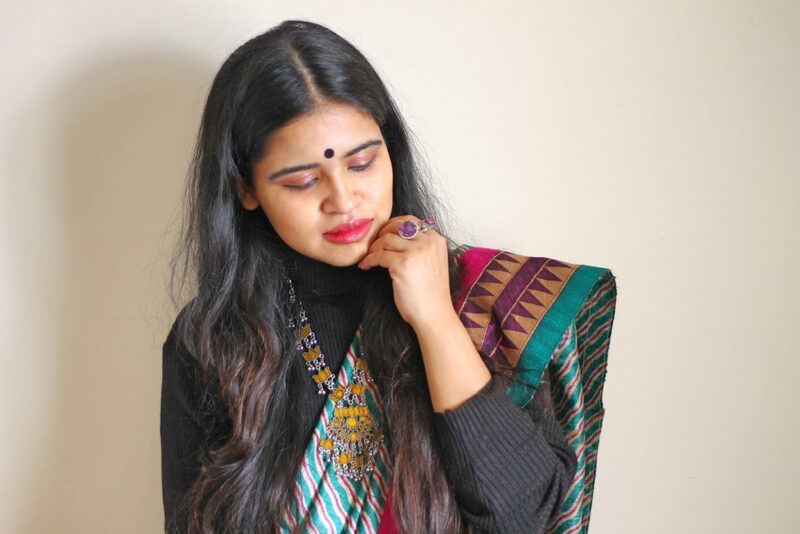 So here, my look is revolving around my old raw silk saree which I think is a great pick for parties and other special occasions during winters. I paired my saree with a black high neck sweater which is almost 15 years old (believe me). The colors of the saree stood beautifully against the black color. 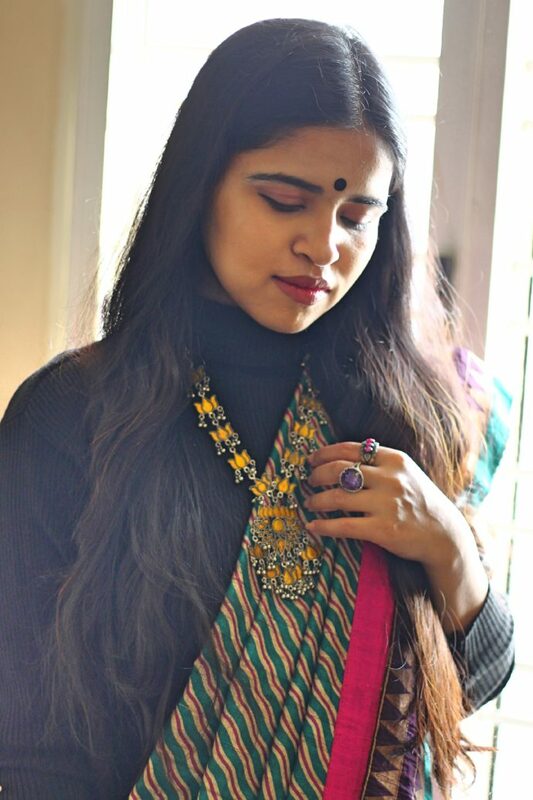 My finishing touches included a mustard glass silver neckpiece, some silver rings, a blue silk potli and of course a big bindi to round off my winter saree style. 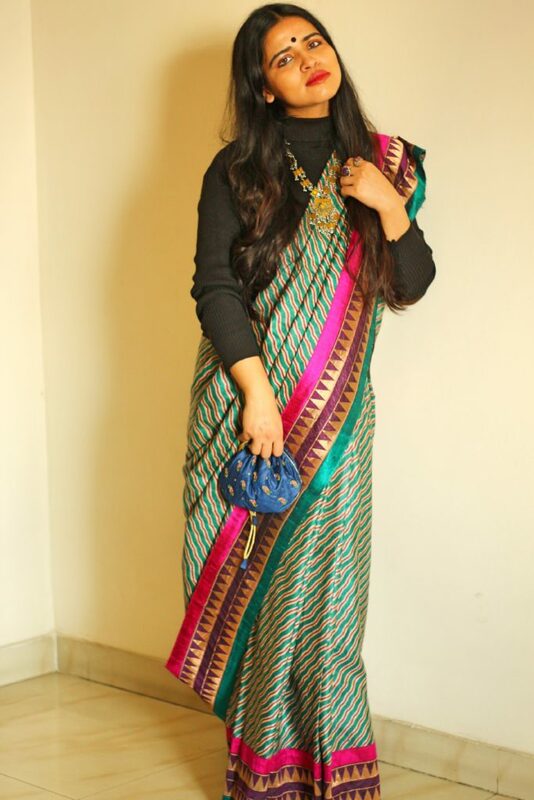 I think this is a good way of reinventing saree style for winters! 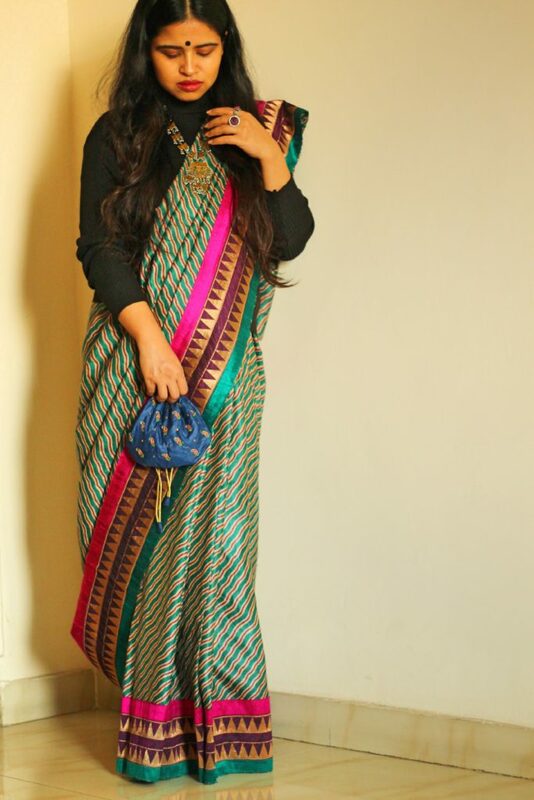 Style tip: Choose sarees which are appropriate for the winters like raw silk, tussar silk, Banarasi silk, Kanjeevarams. Cotton or chiffons are not a wise choice for winters unless you layer them with thermals and sweaters. 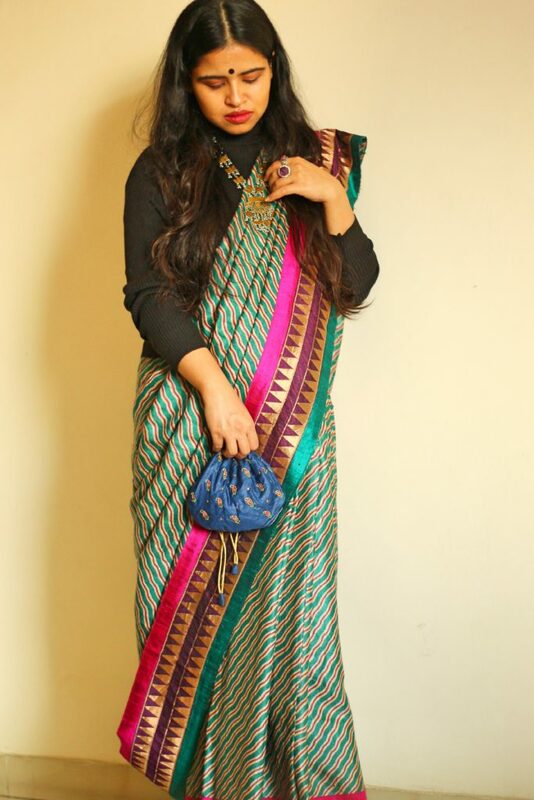 Do let me know how to like to style your sarees in winters in the comment section below! Thank You so much Charu for the style tip. This one is really great. I’ll surely try this one next winter. 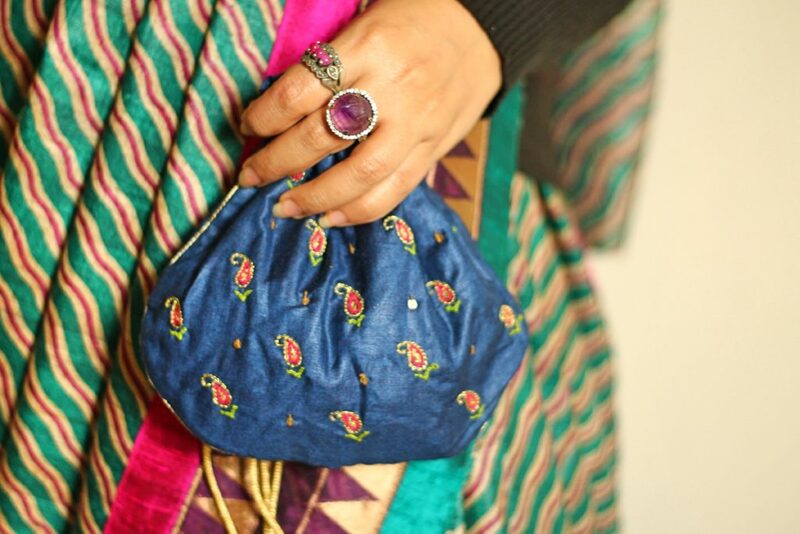 inside to hold your saree? A warm petticoat ? Regular shaped or a straight or fish cut one ? Your advise on this would be really helpful .